This type of leather bag was one of the most common kinds of hand luggage carried in the 18th and 19th centuries. Clothing was never folded, but rolled instead into these bags for travel. Packed for stagecoach or train travel, or strapped behind a saddle, they were made in a variety of sizes for men, women and children. Dennis Knight makes these very special bags by custom order, with different handle placements and in many styles. The bag displayed is a one-of-kind Valise, hand-carved in a Western Floral pattern, with bound edges and lined with brushed pigskin. Please call Dennis Knight for custom orders, starting at $345 in a variety of colors, finishes and carvings. 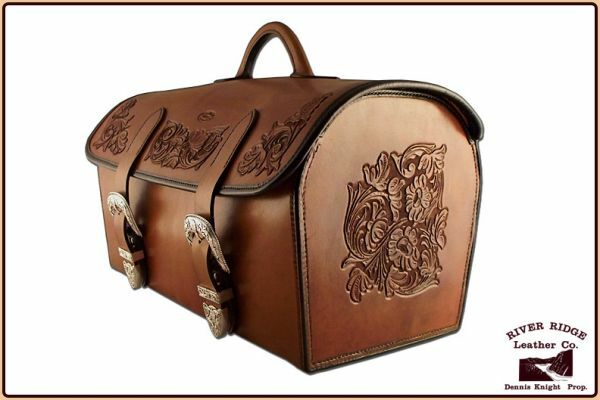 Like all River Ridge Leather goods, this Valise is handmade by Dennis Knight, using only genuine, traditional vegetable-tanned Bridle and Saddle leather and traditional leatherworking tools.